When I first told the other half that we were going to spend a weekend at a children’s festival I thought he might leave us! Who on earth would want to do such a thing? Well, I couldn’t have been more wrong if I tried. Over the 3 days, we did so much so I’m going to split things down to make it all a little more digestible. An executive decision was made early on that we were going to splash out for the Glamping. After looking at the number of options on offer we went with The Canvas Co*. 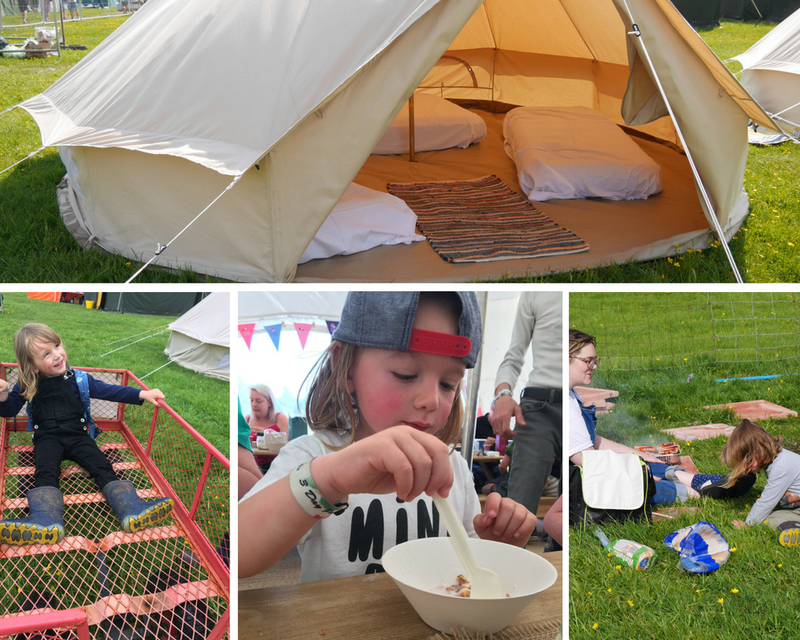 Not only were we able to arrive and find our Bell Tent pitched; we had inflatable beds, clean sheets and as a bonus offer for booking with them we received 2 free passes to Bathing Under The Sky (more on that later). After spending too many years in tents that were too small, we had plenty of space in the tent and also we were able to sneak in a phone charge or 2, so we could carry on taking all the pictures. 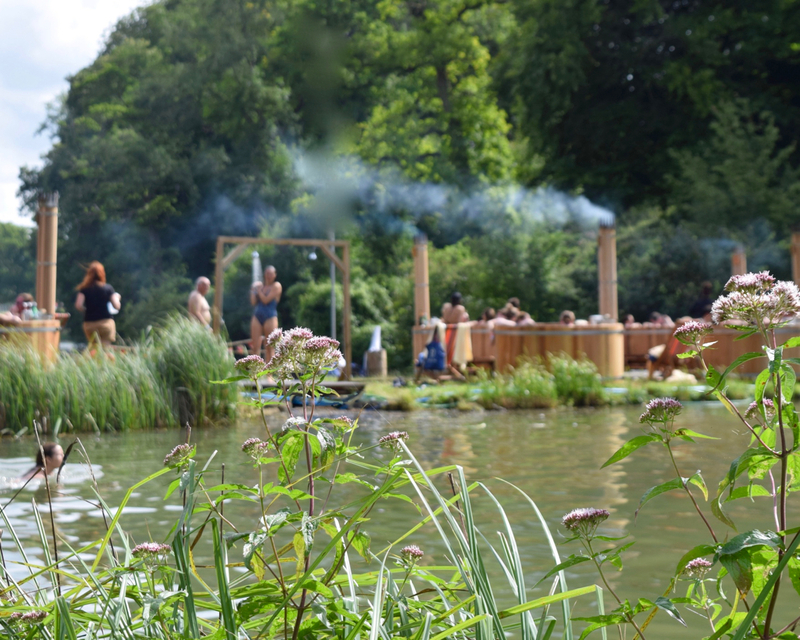 With a designated BBQ area, hot showers and the cleanest portaloos I ever have seen; the whole campsite had such a chilled vibe and seeing children of all ages running around and enjoying the space it really was a sight to see. There was the option of paying to charge your phones if needed, a mini supermarket for those forgotten items (loo roll and biscuits!) along with the most lovely people from The Farmers Wife serving all the food you could need from breakfast till supper time: all locally sourced produce along with a kids menu so you weren’t wasting money on larger portions of food that wouldn’t be eaten. The biggest unexpected bonus of camping was the face that Dorset Cereals had set up a breakfast tent. And so for the 3 mornings, we were all treated to #BreakfastOnTheSlow with all the cereal, yoghurt, preserves and juice you would ever need. Along with Yoga for the kids and grown-ups, live acoustic sessions and the daily papers. It really was a most wonderful way to start off the day. After being spoilt with options in the camping fields, it was refreshing to see a number of food options available in the main areas. Long gone are the terrible grey burgers and here to stay are freshly cooked pizzas, fresh fruit smoothies, gin cocktails and vegan nacho bowls. Whilst there was enough to choose from, it would have been nice to see some children’s portions on offer in the main event space. I appreciate vendors have to make money, but perhaps parents would be more inclined to purchase food that wouldn’t be wasted. I also think some serious money could have been made would perhaps have been a speciality coffee kiosk. At other events, I have seen the guy with the proper coffee machine have a far bigger queue than the beer tent, and as everyone knows I am always in need an of decent, well made fancy coffee. Included in the price of camping for 3 days, all campers were given unlimited access to the fun fair. And on Friday night the main festival site was open to just those few of us that had dared the earlier rain to set up for the next 2 days of mayhem. For 2 hours we just wandered around, got our bearings and went on as many rides as possible. This was the first time the boy has really been to the fun fair and it was quickly apparent he is a bit of a thrill seeker, with the Big Wheel, Bumpy Cars (he has renamed them!) and the Helta Skelter a firm favourite. 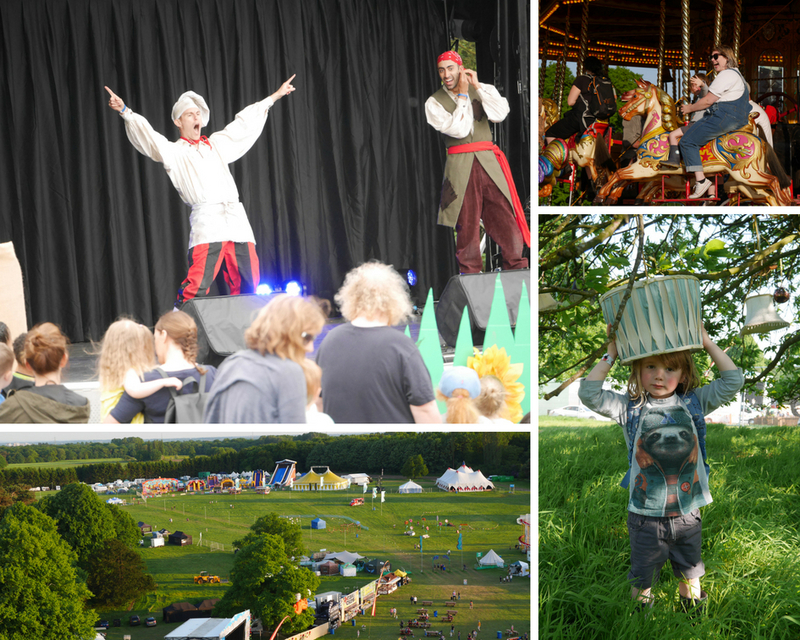 Saturday and Sunday bring the main acts with Cook and Line, Justin Fletcher, Mr Bloom and Andy and the Odd Socks being the main draws over the weekend, with Ben Cajee as the compare for Saturday and Alex Winters on the Sunday. An absolute personal highlight was being called out by Ben when he was on stage for managing to tweet him when the field had very little 4G signal! Our family favourite was Cook and Line……they had all the audience engaged, were genuinely funny and looked like they were having fun too. The biggest crowd (of course) was for Justin, but unlucky for us, there was a bit of aggravation between some of the grownups which dulled the mood a little for some; everyone is asked to sit down so that all the children can see no matter where you are, and some people took umbrage that their darlings were not deemed to be more important as every other child there. Personally, not a fan of Justin, and after about 10 minutes, the kid decided he wasn’t interested either and so we headed off to find other things to try out. One of our memory making moments for us was watching the live music around 8pm on Saturday evening and the boy just got lost in the sounds. He found his groove and was dancing and jiving and running around along with a few other kids who were all partying way past any usual bedtime routine. Side note; the kid still hasn’t forgiven us for leaving him even though he had fun and made a friend!. So off we went and sat in traditional wood-burning saunas at a toasty 36 degrees (I had a constant battle with the hosts to not make any hotter! ), chatted with other parents about the joys of rabid children and kids clubs (there were 6 to a tub, and we all had one common ground of conversation), got to jump/ wince into the ‘cool’ pool, melt even more in the sauna and all topped off with a refreshing cold shower. We deliberately booked our slot for Sunday evening, knowing that we would probably all need a break (the child included) and it was the perfect way to start winding down. This post is already long enough and I think you get the idea that we thoroughly enjoyed our experience. We were beyond lucky with the weather (we were on thunder watch for 24 hours, but it never arrived) and the fella even said he’d consider doing it again. So for me, that counts as a success.